This oil was requested by my clients to not only help with their conjure practices but their business and artistic practices too. 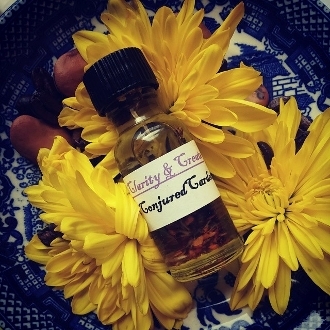 Use this oil to help you create new ideas, express yourself, bring clarity and peace of mind to your art, spiritual and business practices. A great oil to use before work, meditation, conjure work, reading (to absorb information) before classes, seminars, readings-any time you need to be clear and ready to take those ideas and run! Created with blue lotus essential oil, cherry bark, rose hips, master root and more.